With all the dissension, tension and aggression running rampant in the US, it is nice to find a story that makes you smile. Enter the Little League World Series starring the Jackie Robinson West team, the sluggers from Nevada and the Philly team led by female phenom, Mo’Ne Davis. I first heard of Davis when her team ran over Delaware to clinch their spot to head to the Little League World Series. I heard she was the real deal, a force to be reckoned with, a star in the making. And then it happened. Davis became the first girl to pitch a shut out in the Little League World Series. Shut yo’ mouth and the front door!! Instant classic and star. And with that, the Little League World Series was thrust into a spotlight that I have never seen it glowing in. 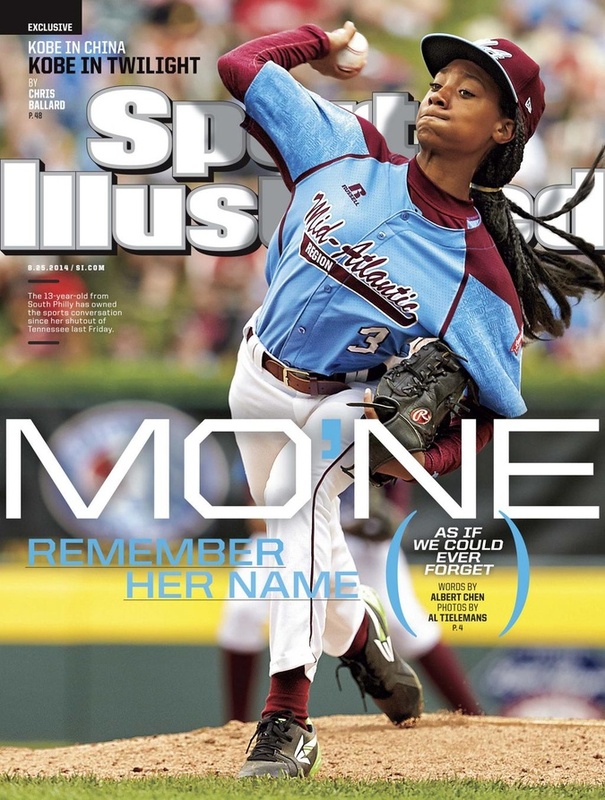 Everywhere I turn, I see Mo’ne Davis’ name. On Twitter. On Facebook. On Instagram. On ESPN. On CNN. And now on the cover of Sports Illustrated as the first little leaguer to ever get the honor. Davis is an inspiration not just for girls but for people all across the world and country who go against the grain and do not conform to what the world says about them. I am willing to bet there have been many people who have come along and told Davis she should play softball instead of baseball. You know, a girls sport. I commend her for being true to who she is and shattering myths and stereotypes. You go girl!!! Then we have those sluggers from Nevada. Those boys can hit!!! As I sat and watched their game against Jackie Robinson West on Sunday, I was captured by their composure. They never seemed to get caught up in the fact that the game was getting out of hand. These young men were putting the ball out the park almost every other at-bat. Four runs in the first, one in the second, three in the third and FIVE in the fourth to deny Jackie Robinson West a chance to catch up after four innings of play. Last night against Davis and her Taney Dragons, it was more of the same. A sixth inning rally which saw Nevada drive in five runs led them straight into the US championship game on Saturday where they will meet either Taney or Jackie Robinson West for the title. Oh, and these boys play some stingy defense! I am still shaking my head at the right outfielder snatching runs from the jaws of Taney after laying out to catch a line drive to the outfield(ala Willie Mays) to prevent them putting runs on the board. You go boys!!! Then we have the Jackie Robinson West team straight out of Chicago. With all the violence in taking place in Chicago it is nice to see something positive happening there. An all black Little League team. There has not been one in the Little League World Series in over 30 years. Tonight, Jackie Robinson West will be playing tonight for a chance to play in the US Little League World Series Championship game. That is something to smile about. For many reasons and I will let you decide on your own which reason makes you smile. The joy that spreads across these boys faces and the way their city is rallying behind them is enough to make me smile. I can only hope that the unity the city is experiencing now can spill over for weeks to come. You go boys!!! If you have not been watching the series, you are missing out. Seeing out youth truly enjoying the game they love while offering up numerous examples of good sportsmanship just makes my heart leap for joy. For all the bad things we hear about our youth, these young ones show us that there is still hope for this generation. May the best boys and/or girl win!! !